Donna Ash — Abandoned her own child. THE DIRTY ARMY:This “nasty pig” as they call her, originally from Owen Sound, is a real piece of work. Her name is Donna Ash. Apparently she’s been nothing but trouble since she was child. Always getting in trouble at school and with the police. She’s been a big disappointment to her entire family for a long time. She abandoned her three year old daughter many years ago and had her family raise her for the past fourteen years. Donna had better things to do with her life, like move out of town to be with her wanna be gangster friends. Due to her low self esteem she spent years with partners that abused her physically, mentally and emotionally. She loves guys that have extensive criminal backgrounds and been in prison. She’s also been using heavy narcotics and been a junkie since her early teens. This brod will use any kind of drug she can get her hands on. From PCP to bath-salts, molly and pepsi, her drug of choice is fentanyl. But she loves to smoke the crack rock too. She goes hog wild for all drugs. Not to mention her love for alcohol too. She spent years as a teenager and young adulthood in very abusive relationships which has done quite a number on her mentally and emotionally. Now that she’s all grown up she has developed Narcissistic Personality Disorder along with several untreated mental illnesses. It’s quite a sad situation to be honest. She’s had plenty of opportunities to seek help and rebuild the broken relationship with her daughter but the truth is she’s happy living her life on the streets doing as much drugs as possible, sleeping with random people for a hot meal and place to stay the night. She actually gets a thrill from shoplifting, robbing people and stealing bikes. Don’t trust this person with anything because she will rob you blind and then bullsh1t and tell lies to turn it around on you when sh1t hits the fan. Classic manipulator and compulsive liar. She admits to having several DRDs and doesn’t seem concerned in the least about it or them. She’s did two years in the federal penitentiary on drug and conspiracy charges. And she’s very proud of that fact, And tries to impress people and uses the story to make new friends all the time. She will rob you, she will lie cheat and steal to get what she wants. 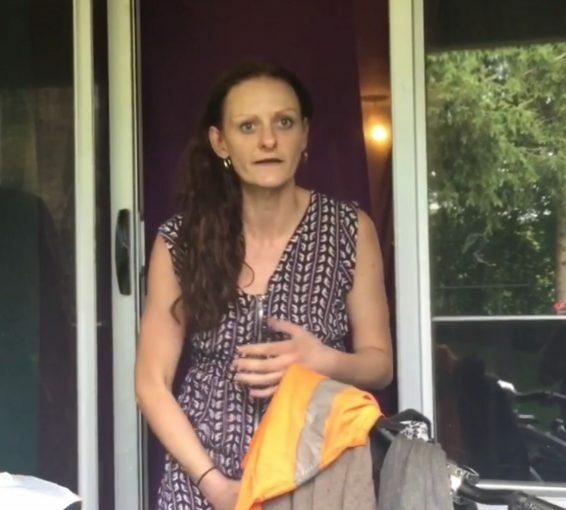 She’s known around Kitchener as a homeless slore that bounces around person to person, imposing on everyone, and just being a straight out nuisance to everywhere she just because this brod just can’t shut up. She knows the answers to everything and never shuts her mouth. Associate with her at your own risk. Her own family hates her and says she’s a lowlife, and even Boil says she a nasty pig. Yeah I remember this girl. Very cold and empty. I think she goes by the moniker ‘booster’ donna because she goes around shoplifting as a way to supplement her drug habit. It’s a name she’s quite fond of. Lol, one quick google search reveals some AWFUL pictures of her past. I also noticed a post on reddit about her.. so she must have been tossed around for time. She has seen more dickends than weekends fellas. Where’s the kid now? Yes this one here stole my bike. She stole my $1200 bike and probably sold or traded it for dope.